This notice is to highlight a recurring problem that has been identified with gas supplies to multi-storey timber framed buildings. 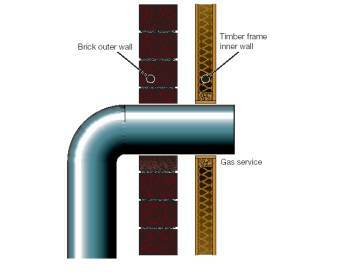 The investigation of a gas release at a block of flats in Bothwell, Scotland identified that a release of gas had occurred following the fracture of a mallable iron fitting on a steel gas service, the building was evacuated. It was identified that shrinkage had occurred in the timber frame relative to the external brick shell- see diagram below. The identified mode of failure was due to the imposition of excessive loads from the timber frame upon the gas service, due to the cumulative effect of shrinkage of the timber frame (this shrinkage usually occurs within the first year of construction). The effect is most notable in the upper stories - see photographs below. 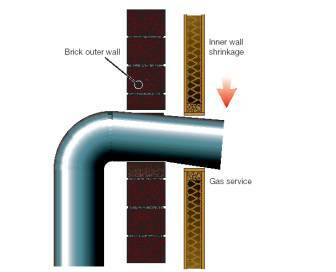 Due to the mode of failure and the type of building construction it is possible for large volumes of gas to accumulate in the area between the external brick wall and the internal timber frame structure. The use of multi-storey timber frame construction has developed over the last ten years and buildings of up to five storeys are now more common. Duty holders should identify where gas services have been installed in this situation and take action to ensure that excessive forces are not exerted upon such services. Duty holders should also ensure that measures are in place to identify the type of construction being used before installing gas services. Services passing through the external brick structure and the timber frame should be designed to accommodate the differential movement between the frame and the external structure. It should be noted that this should apply to all services (gas, water, electricity). Guidance for the installation of gas services in multi storey dwellings is provided in the Institution of Gas Engineers documents IGE/TD/4 (Gas Services) and IGE/UP/15 (Gas Installations in Flats). Photograph 1 - Showing movement of timber frame (at third floor) relative to external shell. Diagram 1 - Showing relative movement.